Is the outside cover part of it detachable so I can clean? Yes it is. It detaches for cleaning the venting. I have this kit installed. Birds are nesting in it in the Spring. Is there a pest cover for this termination box? Can I seal the outside of Securevent with high temp silicone caulk rated at 500 degree F. I would like to seal where two pipes come together. Or is it cool enough to use aluminum foil tape? Per the manufacturer, no sealant or foil tape is needed when connecting the Secure Vent pipe sections. Please see the manufacturer's instructions below. Align the dimpled end over the collar, adjusting the radial alignment until the four (4) locking dimples are aligned with the inlet of the four (4) inclined channels on the collar (Figure 16). 2. Push the vent component against the collar until it fully engages, then twist the component clockwise, running the dimples down and along the incline channels until they seat at the end of the channels. NOTE: The unitized design of the Secure Vent� components will engage and seal both the inner and outer vent pipe. 3. If desired, a #6 x 1/2" screw can be used at the joint, but is not required as the pipe will securely lock when twisted. Can this connect directly to the fireplace for rear venting fireplaces if we are venting it directly, horizontally? Yes, depending on the the total distance from the back of the compatible Superior/IHP direct vent unit, this vent kit may be all that is needed. 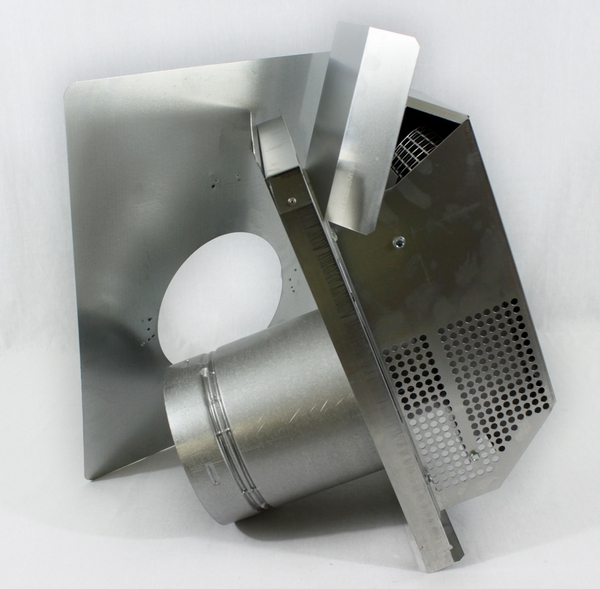 What is the inside and outside diameters of this Superior SecureVent horizontal termination kit double wall pipe? The Superior SecuveVent system is designed to only be utilized with specific Superior brand fireplaces. The inner diameter of this pipe is 4.5", with an outside diameter of 7.5". All of the items were easy to install. ProsTheir website offered all the technical help that I needed! The vent was very easy to install. I used it in a brick veneer wall. I was able to remove the outer portion so that I could easily caulk around the pipe portion.